Twins Victor and Vance know that their Cirque Caprice is not just about acrobats and trapeze artists. There’s magic involved in the circus, whether it’s runaway psychics or non-human performers that keep everyone jumping. Sometimes running away and joining the circus is just the thing to turn someone’s life around. Victor and Vance both find love within the show, while a pair of male tumblers find the woman of their dreams and ringmaster Amadeo comes back together with a lover from his past. 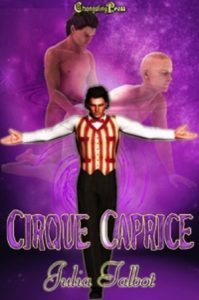 This collection contains the previously released novellas Tarot, Tumbling, Flying, and Ringmaster in the Cirque Caprice series.